This Apple Pie has two layers of buttery crisp pastry enclosing slices of tangy sweet apples covered with cinnamon sugar. It is an American classic. While perfect on its own, you may want to try it with a scoop of vanilla ice cream, a dollop of softly whipped cream, or with a slice of sharp cheddar cheese. We start this Apple Pie by making the Apple Filling. I do this step first, even before I make the pastry, because I like to macerate the apples slices with a little lemon juice, white and brown sugars, and ground cinnamon for about one to two hours. As the apple slices sit, they release their juices. Then we take these juices, along with some cornstarch, and boil them until they're wonderfully thick and translucent. This flavorful mixture is then added back to the sliced apples and the result is a delicious apple filling. The added benefit of this technique is there won't be a large gap between the baked apples and the top pastry crust that you often have with apple pies. The gap occurs because apples contain water and as the pie bakes the apples release their juices causing the apples to shrink, which often leaves a large gap between the baked apples and the top crust. Macerating the apples first solves this problem. As far as what type of apples to use, I like to use a tart tasting apple with a firm texture so it will not lose its shape, and become mushy, when baked. Granny Smith, Honey Crisp, Gala, Golden Delicious, and Braeburn are some year round favorites. And I like to mix two or three different varieties of apples (in this video I used Granny Smith, Honey Crisp, and Gala) which gives a wonderfully complex flavor to the apple filling. Also, during the Fall, try to use locally grown apples as they have superior flavor and texture, and there is the added bonus of supporting your local farmers. Lastly, when you pull the baked pie out of the oven there is the temptation to cut into it right away. Resist doing this. Fruit pies need several hours to set so that when you cut into them the fruit is juicy but their juices are nice and thick. Apple Filling: Place the slices of apple in a large bowl and toss with the lemon juice. Add the sugars, ground cinnamon, nutmeg, and salt and toss to combine. Put the apples in a large strainer, cover with plastic wrap, and place over a large bowl (to capture the juices). Let the apples drain for about 1 to 2 hours. While the apples are macerating, make the pie crust. Pie Crust: In a food processor, place the flour, salt, and sugar and process until combined. Add the butter and process until the mixture resembles coarse meal (about 10 seconds). Add about 1/4 cup (60 ml) water and process until the pastry just holds together when pinched. If necessary, add more water. After the dough has chilled sufficiently, remove one portion of the dough from the fridge and place it on a lightly floured surface. Roll the pastry into a 12 inch (30 cm) circle. (To prevent the pastry from sticking to the counter and to ensure uniform thickness, keep lifting up and turning the pastry a quarter turn as you roll (always roll from the center of the pastry outwards).) Fold the dough in half and gently transfer to a 9 inch (23 cm) pie pan. Brush off any excess flour and trim the edges of the pastry to fit the pie pan. Cover with plastic wrap and place in the refrigerator. Then remove the second round of pastry and roll it into a 12 inch (30 cm) circle. Transfer to a parchment lined baking sheet, cover with plastic wrap, and place in the refrigerator. Apple Filling: After the slices of apples have macerated for about 1 to 2 hours, you should have about 1/2 cup (120 ml) of apple juice. Pour the juice into a saucepan. Place over medium high heat and boil the juices for about one minute. Then remove from heat. In a small bowl whisk the cornstarch with about 1/2 - 1 tablespoon water, until you have a thick paste. Whisk the cornstarch mixture into the apple juices. Return to heat and boil, whisking constantly, until the mixture is translucent (about 1-2 minutes). Let cool to room temperature. Next, transfer the drained apples slices to a large bowl, add the cooled apple mixture, and toss to combine. Pour the apple filling into the chilled pie crust. Dot with the butter. Gently place the top crust over the apples. Tuck any excess pastry under the bottom crust and then crimp the edges using your fingers or a fork. 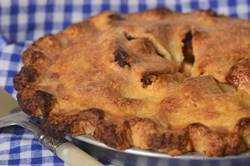 Using a sharp knife, make five- 2-inch (5 cm) slits from the center of the pie out towards the edge of the pie to allow the steam to escape. Cover the pie with plastic wrap and place in the refrigerator to chill the unbaked pie while you preheat the oven. Preheat the oven to 425 degrees F (220 degrees C). Place the oven rack in the lower third of the oven and place a baking sheet on the rack before preheating the oven. In a small bowl whisk the egg with the water. With a pastry brush, brush the top of the chilled pie with the egg wash and sprinkle with granulated white sugar or sparkling sugar. Set the pie on the baking sheet and bake for about 45 to 55 minutes or until the pastry is golden brown and the juices start to bubble through the slits. If needed, cover the edges of the pie with a pie shield or foil to prevent over browning after about 30 minutes. Remove the pie from the oven and place on a wire rack to cool for about 3-4 hours before cutting. Serve warm or at room temperature with vanilla ice cream or softly whipped cream. Store at room temperature for 2 days or in the refrigerator for 3 to 4 days.